Have you ever wondered why books often have a foreword? Why would one author ask another to write a little mini-chapter at the front of his book? Having been asked to provide one for Jamie Dunlop’s Budgeting for a Healthy Church, I had to think it through. I believe the reason is two-fold. First, it’s meant to give you, the reader, confidence in the author of the book, to assure you he or she is qualified to write about the subject. Second, it’s to give you a sense of whether or not this book is one you’d benefit from. So here’s the first question: Are you in good hands as you read Budgeting for a Healthy Church? I’m glad to say you are! Jamie Dunlop has a successful background in the the world of business, and was then called by his church to serve as an Associate Pastor. For the past 10 years he has helped pastor the members of Capitol Hill Baptist Church in Washington, DC, while giving particular oversight to matters related to administration and finance. He has also been involved in 9Marks, a ministry committed to creating resources that help foster healthy churches. Much of what is released under the banner of the ministry is produced by the church. This means it has been field-tested and shown to actually be effective. What you read in this book is not abstract, but practical and proven. Here’s the second question: Should you read this book? That depends on who you are. 9Marks exists to help unhealthy churches become healthy and healthy churches to remain that way. What we know to be true about our use of money personally is equally true about our use of money congregationally—it can demonstrate spiritual health or spiritual weakness. 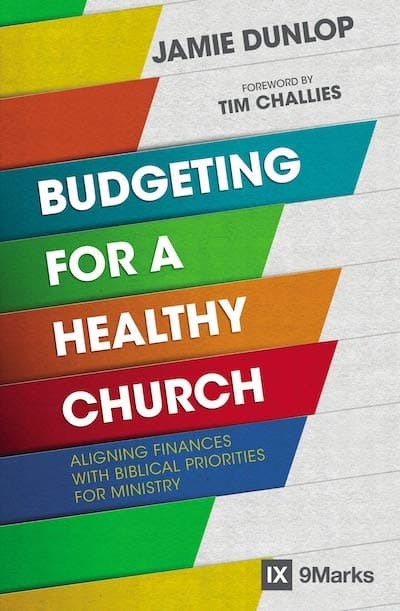 If you are a member of a church, this book will help you better understand how your church can budget its money toward health. If you are a pastor or leader of a church or otherwise involved in preparing and monitoring that budget, it will prove especially beneficial. It may not tell you how much to allocate to each column on a spreadsheet, but it will give you biblical wisdom on how money is so closely tied to our God-given mission. It won’t answer your every “how” question, but it will certainly assist you better understand the many “what” questions about your church and its finances. What Jamie wants you to know is this: your budget reveals your values. The way your church allocates its financial resources tells so much about what you value most and about what you mean to accomplish in the name of Jesus Christ. A healthy church will demonstrate health in its finances. With time short and the mission urgent, there’s every reason to ensure your church and its budget is healthy. Therefore, I believe there’s every reason to read this book and to put its principles into practice. For that reason I highly recommend it. How Do You Know if Your Church is Healthy?